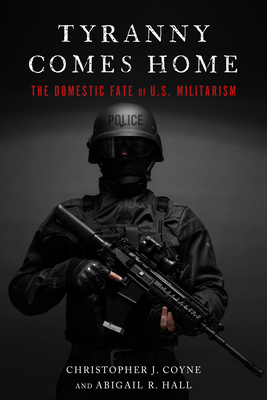 Coyne and Hall examine this pattern--which they dub "the boomerang effect"--considering a variety of rich cases that include the rise of state surveillance, the militarization of domestic law enforcement, the expanding use of drones, and torture in U.S. prisons. Synthesizing research and applying an economic lens, they develop a generalizable theory to predict and explain a startling trend. Tyranny Comes Home unveils a new aspect of the symbiotic relationship between foreign interventions and domestic politics. It gives us alarming insight into incidents like the shooting in Ferguson, Missouri and the Snowden case--which tell a common story about contemporary foreign policy and its impact on our civil liberties. Christopher J. Coyne is Associate Professor of Economics at George Mason University and Associate Director of the F. A. Hayek Program for Advanced Study in Philosophy, Politics, and Economics at the Mercatus Center. He is the author of Doing Bad by Doing Good: Why Humanitarian Action Fails (Stanford, 2013) and After War: The Political Economy of Exporting Democracy (Stanford, 2008). Abigail R. Hall is Assistant Professor of Economics at the University of Tampa.